Even though Super Street Fighter IV: 3D has "3D" in the game's title, players don't have to fight in 3D — even if their opponent is. So, relax. As revealed at the recent Nintendo World event, players can select either 2D or 3D for worldwide online play, and their selection has not bearing on how their opponent views the match. 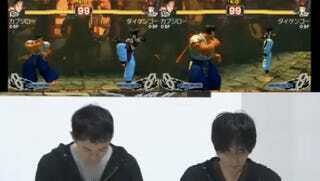 The 3D point-of-view is called "Dynamic Mode" and features an over-the-shoulder camera angle, while "Normal Mode" is more traditional 2D-style fighting when they select one of 35 available characters. What's more, the spectator mode, which is called "Channel Live", also allows folks to select 2D or 3D as they watch other players duke it out online. Nintendo's not the only one refraining from shoving 3D down the throats of players, game companies like Capcom are playing it cool, too. All this makes the 3DS's 3D capabilities seem like an additional feature, instead of the main one.